On the last day of Symposium I had another class with Jen Kingwell. This time it was for her Glitter quilt, which is a pattern I've admired for some time. We had the option of machine piecing or hand piecing our blocks, but I decided to practice the hand piecing that I'd learnt in Jen's earlier Green Tea and Sweet Beans class. I'm so glad I chose hand piecing because it was so relaxing. I was at a table with three other friends from Capital Quilters guild, and we just chatted as we each slowly made some blocks. Two of them were using the sewing machines, but hearing their occasional frustrations made me please I'd decided to hand piece. I only made two blocks during the class, but there was no pressure to go faster. I'll need 152 blocks if I want a big quilt, so the difference between making 2 or 3 in class is negligible. I've made a quite a few more blocks since I got home. I unpacked my bags, and stood back from the table trying to decide which of my new projects I'd pick up first. It was like trying to decide which of your children to hug first - I loved them all, but could only pick one. I chose Glitter, partly because I really enjoyed the class, and wanted to continue that calmness that comes with hand piecing. Here are some close up photos I took of Jen Kingwell's Glitter quilt. It's hand quilted very simply with straight lines down and across in Aurifil 12wt. 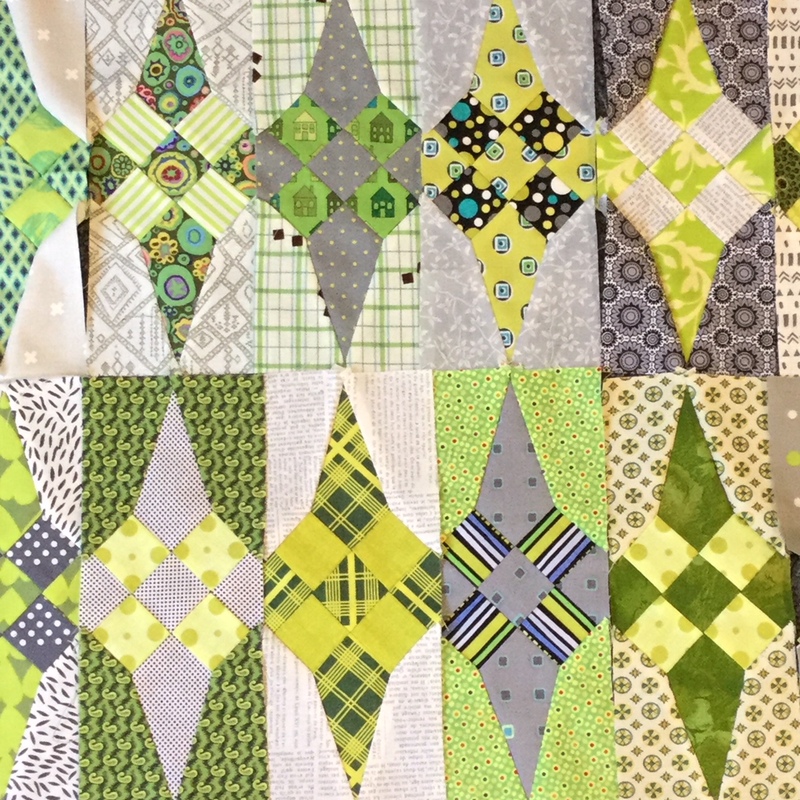 Jen said she still intends to add more quilting, but this is enough to hold it all together. She uses Quilters' Dream Cotton Select batting so can leave up to 8" unquilted. Jen tends to use very light backings like voile. Wendy - what a fetching quilt! Green is so fresh. But what really caught my eye was that two-tone green plaid fabric on the top of the pile of fabric in your second photo. I have been desperately looking for one yard of this very fabric to finish a project for a very long time. Is there any possibility you would have a one-yard piece of this that I could purchase from you? I would be happy to pay any attendant postage as you are indeed across the ocean from me! I have tried so many other greens in my project and just can't find a better option than this fabric. I eagerly await your reply! Wow that is going to be lovely...time consuming but lovely! This is one of my favourite quilts from the book. I had to really look to see where her quilting was. Love the colour palette you have chosen. You are off to a great start! It is a very cool design and I love the colourway you have chosen. I know what you mean about deciding on which Symposium project to finish first...I really wanted to get onto ALL of mine but the decision was made easy as I need a quilt for a charity auction (which is now in two weeks time) so have continued with the serendiptiy circle blocks from my Brenda Gael Smith class - just got binding to do but the Fast Five netball champs are currently distracting me!